Designed to preview a new generation of future its vehicles, Infiniti says the Q Inspiration Concept proposes how an innovative powertrain, next-level autonomous drive technologies, and a human-centric interior could enrich the experience of drivers in the mid-sized saloon segment. 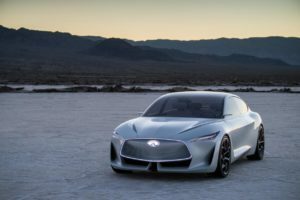 Powered by Inifiniti’s recently launched VC-Turbo engine, the company says the concept car “boasts a powertrain combining turbocharged gasoline power with the torque and efficiency of a hybrid or diesel engine”. The Q Inspiration also points towards the next phase of vehicle autonomy for Infiniti. The new ProPILOT functionality is designed to liberate the driver from mundane and stressful driving situations by acting as a ‘co-pilot’ and leaving the driver with ultimate control.